DISTRICT 23-6A GOLF CHAMPIONS - The Pearland Lady Oilers "A" Team shot a record-setting 628 to finish 104 strokes over the second-place team to capture the 23-6A golf title. They also swept the top three individual medalist honors. Members of the team include (l-r): Makenzie Jeffery, Kaylah Angel, Bailey Rucker, Alexis Guerra, Kendall Jackson, Addie Poulin, Juliana Hudman, Logan Vaughn, Lindsey Diehl, Caitlyn Evans, Alexa Vela, Ariel Perry. The regional tournament is at Eagle Pointe Golf Club in Mont Belview on April 23-24. PEARLAND — In record setting fashion, the Pearland Lady Oilers captured the District 23-6A golf championship while teammates sophomore Kendall Jackson and freshman Alexa Vela led the way. Both golfers tied for individual medalist honors shooting 152. Jackson won a playoff on the second hole with a par. The Lady Oilers, as a team, totaled 628 while second-place Dawson shot 732 for a difference of 104 strokes. Jackson shot a two-day total 80-72 while Vela shot 81-71 with both totaling 152. Others members for Pearland were Juliana Hudman (76-80=156), Kaylah Angel (84-92=176), and Addie Poulin (92-84=176). Jackson, Vela, and Hudman swept the top three individual places. 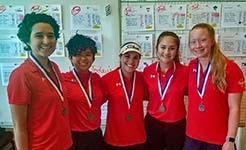 "The Lady Oilers “A” team came out sharp shattering one and two day team total records, as well as individual scoring records," said PHS golf coach Robert Stiles. "A new one day team record was also set as well: 321. "Day two saw the continued rise of two young players: sophomore Kendall Jackson, and freshmen Alexa Vela. Both players set new scoring records on day two – Kendall shooting a two over par 72, and then Alexa breaking the record with a 71. The previous day’s team record was smashed with a 307.". DISTRICT 23-6A RUNNER-UP - The Dawson Lady Eagles golf team placed second at the 23-6A golf tournament with a score of 732. Members of the Dawson golf team include: Bianca Salinas (senior), Alee Matildo (sophomore), Sophia Aguirre (senior), Isabella Partida (freshman), Kristin Ensmann (senior). The regional tournament will be held at Eagle Pointe Golf Club in Mont Belview on April 23-24. The Dawson Lady Eagles shot 732 to finish in second place. Bianca Salinas led the way for Dawson with an 81-83=164 that gave her a fourth-place finish for medalist honors. Other team members for Dawson include: Sophia Aguirre (87-82=169), Alee Matildo (98-88=186), Kristin Ensmann (110-103=213), and Isabella Partida (110-105=215). The Pearland "B Team" finished third in the district standings with a score of 734. Team members include: Logan Vaugh (82-82=165), Caitlyn Evans (84-92=176), Lindsey Diehl (100-93=193), Bailey Rucker (99-101=200), and Alexis Guerra (116-105=221). The top three teams advance to the regional tournament that will be held at Eagle Pointe Golf Club in Mont Belview on April 23-24.